O What are the differences between different forms of washers? 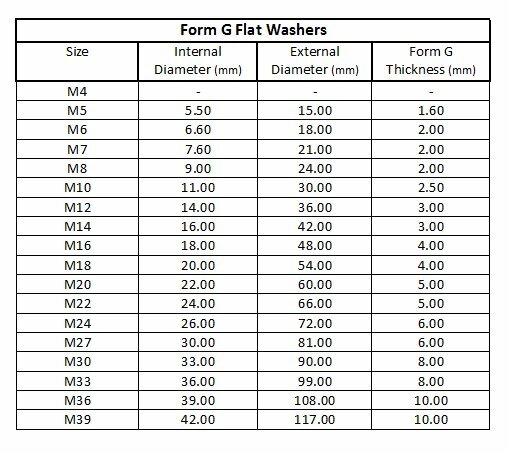 Home » Technical Information & General Help » What are the differences between different forms of washers? What are the differences between different forms of washers? There are several different forms of flat washers, designated by a letter code from A to G. Some are only available in a particular finish, but what exactly do the different forms stand for? 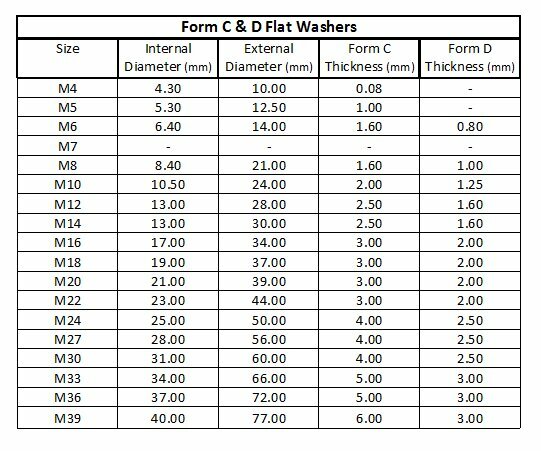 Simply put, each washer has to have certain dimensions to be classed in a type of form, so no matter where you buy from or where the item was manufactured, all washers designated the same form will have the same measurements. 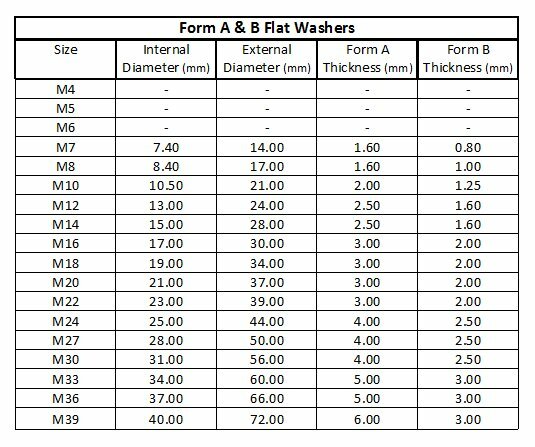 In the images below, you can see what the measurements are for the most common washers we stock. 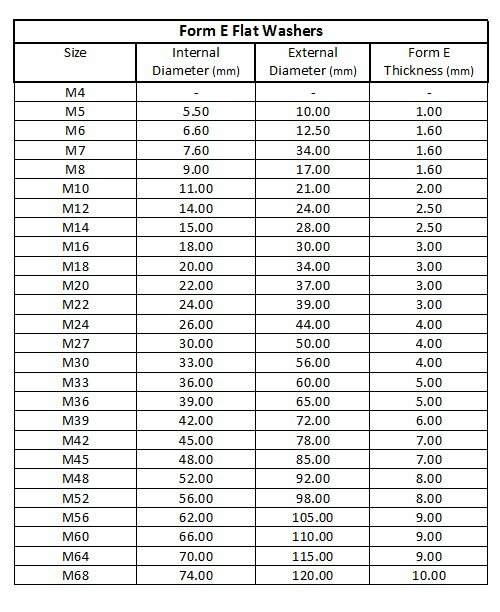 By using these tables we can see that an M10 Form A washer will have an internal diameter of 10.5mm, an external diameter of 21mm and be 2mm thick. 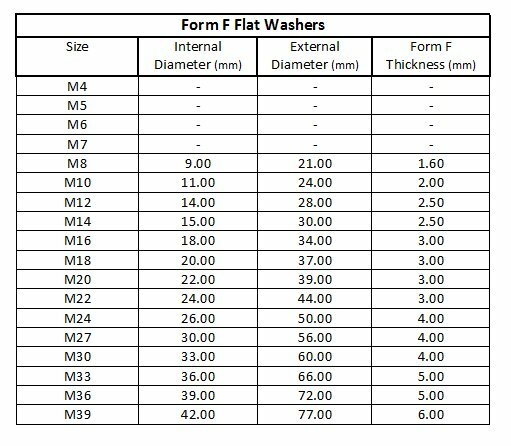 If any of these measurements are not correct on the manufactured part, is can not be called a Form A washer. It's important to note that there are tolerances allowed within the specification. This is usually 1mm either side of the dimension stated. The thickness is usually correct as the products are made from sheets of raw material, which in turn have their own specifications and standard thicknesses.